What is the Graduate Student Research Forum? 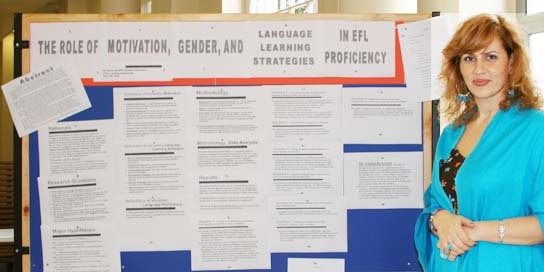 On April 29, 2006 the Education Department conducted its second Graduate Student Research Forum. 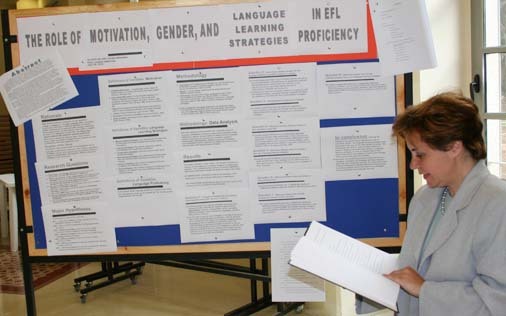 This Forum consisted of a formal poster session and an informal roundtable discussion. In the poster session, graduate students presented completed research and projects as well as works in progress. 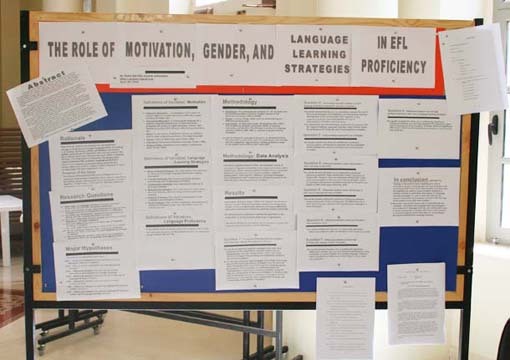 This is a common presentation format used in conferences in Education and other disciplines in which presenters display written summaries of their work on boards set up in a large room and are available to discuss their projects as attendees circulate examining the displayed work. It provides an opportunity to a large number of people to make their work known to and discuss their work with interested colleagues in a relatively short period of time. The roundtable discussion provides interested graduate students with the opportunity to discuss issues related to theses and projects. The primary goal of the Forum is to enrich the graduate research culture of the Education Department. Graduate students participating in this event will increase the visibility of their work and will contribute to establishing a vibrant community of active graduate student researchers. Those who participate will gain valuable professional experience in presenting and discussing their work. There will also be an opportunity for those presenting work in progress to get feedback and participate in discussion regarding any stage of the research process with peers, advanced graduate students, recent graduates, and faculty. Each participant is given a board about 1.5 m X 1.5 m on which to present their work. Each presenter must be present near his/her poster during that period to answer questions and discuss their work with attendees. The graduate student has to provide a summary of his/her project, reporting all aspects of the work: literature review, research questions, method, results and a discussion of results and their significance.